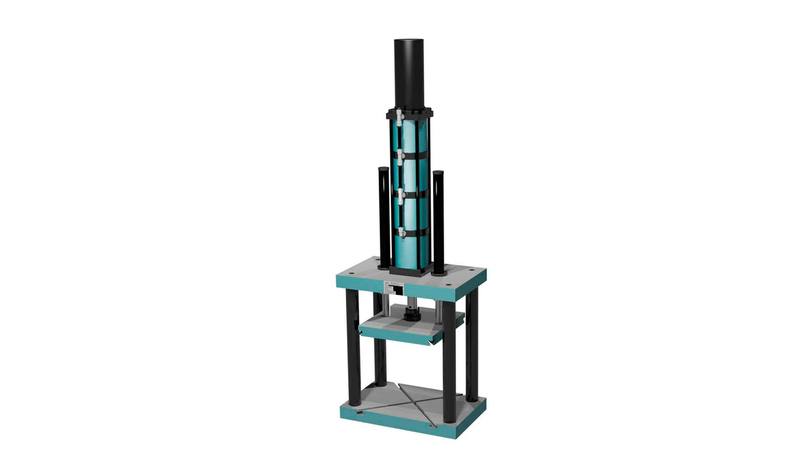 DAP type portal presses are pneumatic table presses, used in the industrial environment for assembly and pressing, for punching and crimping, for bending and for riveting. They are used where great forces and small deflections are required. The symmetrical design with four columns acting as tie rods provides advantages over the C frame design. All pneumatic cylinders used are proven standard components, operating in a direct-acting and bidirectional operating mode. In seven sizes, compressive and retreat forces between 4.5 kN and 34 kN are available. The working stroke is a maximum of 80 mm and is independent of the size. All configuration stages can be used with a control unit (MPS-1) in stand-alone operation on manual workstations. TPC-MIDI process monitoring can also be integrated. In addition, the use of portal presses for plant integration is also possible. The versatile presses are used in almost all branches of the manufacturing industry.